February ushers in the madness, pageantry, and revelry of New Orleans' biggest and most famous celebration--Mardi Gras! This month we bring you images of the more private side of Mardi Gras which most visitors (and many New Orleans residents) rarely see. On display here are reproductions of historical Carnival memorabilia--a Carnival "throw," a letter from Rex, and invitations,favors and an admit card from the Carnival balls given by the krewes that also put on the parades that we all enjoy. The items shown here are from the Louisiana Division's extensive Carnival Collection--some 11,000 pieces, dating from the 1860s to the 1990s--including invitations, admit cards, programs, dance cards, favors, doubloons, Zulu coconuts, float designs, and other items chronicling the history of the biggest party on earth. Shown above is an 1897 admit card to the ball of the Knights of Mithras, celebrating its 100th anniversary in 1997. 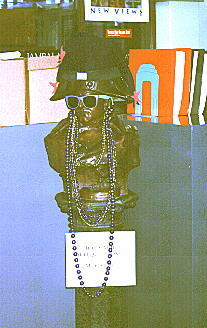 Mithras is one of a number of krewes that does not parade but celebrates Carnival with an annual ball. 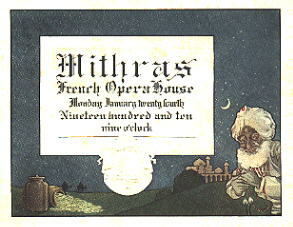 An invitation to the Mithras ball from 1910. 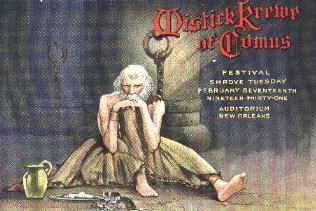 An invitation to the ball of the Mistik Krewe of Comus. Comus was the first Carnival organization to stage a formal parade, in 1857, and the first to use the term "krewe" to describe its club. Until 1992, the Comus parade was the last parade to roll on Mardi Gras night, closing out the season for the people on the streets and ushering in the forty lean days of Lent. Comus no long parades, but it continues to hold its ball on the final evening of Mardi Gras. 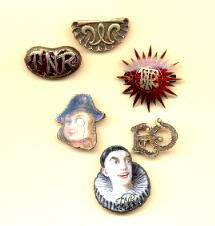 An assortment of lapel pins, given as favors to attendees of Mardi Gras balls. This pins are from the balls of the following krewes (clockwise from top): Momus, Twelfth Nigh Revelers, Twelfth Night Revelers, Twelfth Night Revelers, Elves of Oberon, and Atlanteans. This Zulu "throw" is unusual, but it is not as unusual as the famous Zulu coconuts (we couldn't scan one of those), hand made by the krewe members and perhaps the most prized of all Mardi Gras throws. The Zulu Social Aid and Pleasure Club, which first paraded in 1909, is a traditionally African-American krewe and began as a satirical comment on the old line white-only krewes. Today, the arrival of Zulu at the riverfront on Lundi Gras (the Monday before Mardi Gras) and the Zulu parade early on Mardi Gras morning are among the most awaited spectacles of the season. To find out more, visit the Zulu Home Page. 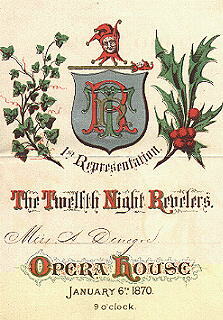 An invitation from 1870 to the first Twelfth Night Revelers' bal masque. January 6, "Twelfth Night," is the beginning of the Carnival season, and the Twelfth Night Revelers' ball on that evening is one of the events that "officially" opens the Mardi Gras festivities. This letter from Richard Freeman, Rex of 1959, is part of a small group of "School of Design" papers within the Louisiana Division's Carnival Collection. Rex, the king of Carnival, first paraded in 1872, and the krewe celebrates its 125th anniversary this year. 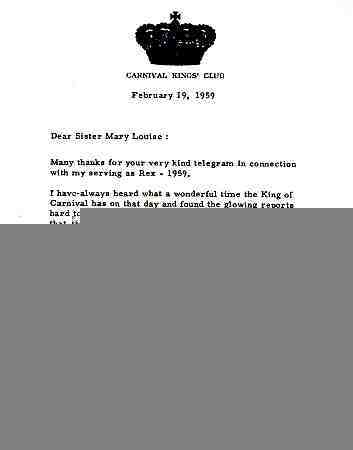 The letter thanks Sr. Mary Louise, O.P., the President of Dominican College, for her telegram congratulating Rex upon his election as King of Carnival.